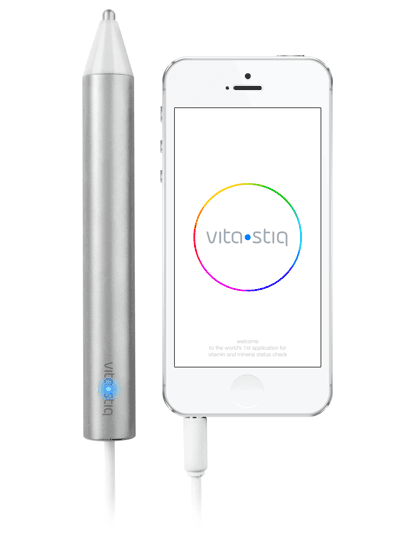 The Vitastiq pen works with a free app to indicate your general vitamin and mineral trend. The pen is non-invasive and painless. 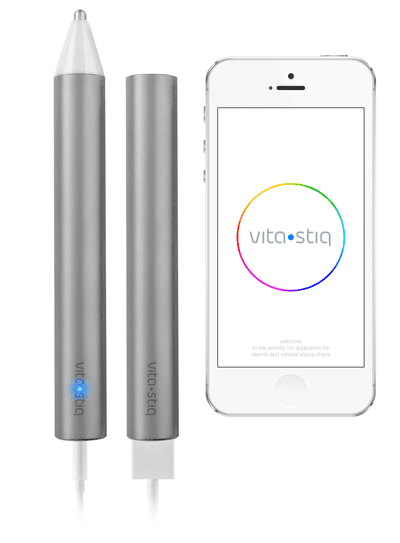 Vitastiq shows the summary of your vitamin and mineral readings, allowing you to track the general trend of 26 nutrients over the course of time. To support your fit lifestyle, it also provides information about vitamins and minerals and their natural sources. 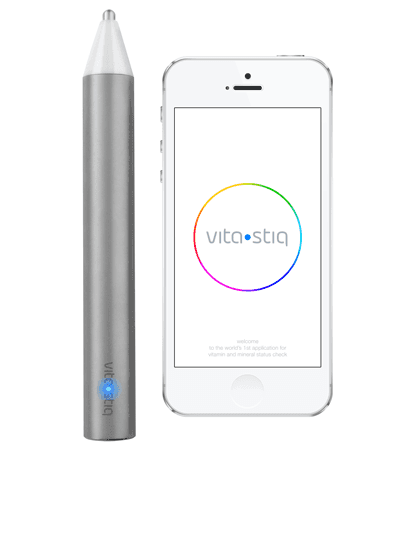 Vitastiq tracks 26 essential vitamins and minerals in your body. Biotin is a B-complex vitamin and an important component of enzymes in the body that break down fats, proteins and carbohydrates. Biotin plays a significant role in the metabolic pathway of all cells including brain and nerve cells and is crucial for the normal functioning of the nervous system. Involved in the synthesis of keratin, a protein responsible for hair, nails and skin surface strength, Biotin is a vital ingredient of all vitamin and mineral beauty formulas. A lack of Biotin is rare. However, an occurrence may lead to a skin rash, loss of hair, high levels of cholesterol and heart problems. Calcium is a mineral found in many foods. The body needs Calcium to maintain bone strength and to carry out important functions. Almost all calcium is stored in bones and teeth, where it supports their structure and density. The body also needs Calcium for muscles to move and for nerves to carry messages between the brain and each body part. In addition, Calcium is used to help blood vessels move blood throughout the body and to facilitate the release of hormones and enzymes that affect almost every function. Chromium is an essential mineral for the body. Known to enhance the way our bodies use insulin, this mineralcontributes to the maintenance of normal blood glucose levels. Chromium also appears to be directly involved in carbohydrate, fat, and protein metabolism. People who eat highly-refined diets (especially those rich in simple sugars) may be at risk of deficient Chromium intake. Infection, acute exercise, pregnancy and lactation, and stress increase Chromium losses and can lead to deficiency. Folate is a water-soluble B vitamin and represents a generic term referring to both natural folates in food and folic acid, the synthetic form used in supplements and fortified food. Our bodies need Folate to make DNA and other genetic material. Folate is also needed for the body's cells to divide. It helps support the production of nervous system function, and in particular, production of messaging molecules that are used by nerves to send signals throughout the body. Adequate dietary Folate (together with Vitamin B6 and B12) helps maintain normal levels of homocysteine. High levels of homocysteine are connected to an increased risk of cardiovascular disease. Inadequate Folate levels in pregnant women put the developing fetus at increased risk of neural tube defects, a developmental condition that adversely affects the nervous system. As the adverse effects occur early in pregnancy, it is important for women to monitor their Folate intake prior to conception. The key material for cartilage tissue formation, Glucosamine is a compound of amino acid glutamine and glucose. Cartilage is a flexible, tough connective tissue found in several areas of the body. This fine, rubbery tissue functions as a form of padding or cushion for bones and joints. Glucosamine is also found in the hard covering of shellfish. With age, glucosamine levels decrease, which can lead to eventual joint deterioration. Magnesium is crucial to the body's function. This mineral is necessary for energy production and the functioning of almost all metabolic processes. Magnesium helps keep blood pressure normal, bones and teeth healthy, and the heart rhythm steady. It is essential for normal functioning of the nervous system and in muscle tissue where it works together with Calcium. In a normalmuscle contraction, Calcium acts as a stimulator, while Magnesium acts as a relaxant. Magnesium also contributes to a reduction of tiredness and fatigue. Interestingly, Magnesium is the main ingredient in many antacids and laxatives. An adult body contains approximately 25 g of Magnesium, with 50% to 60% present in the bones and most of the rest in soft tissue. Over time, a habitually low intake of Magnesium increases the risk of illness. Research shows that average American diets frequently fail to contain an adequate supply of the mineral. Those with gastrointestinal diseases (such as Crohn's Disease and Celiac Disease), Type 2 Diabetes, long-term alcoholism or older people are more likely to suffer from too little Magnesium. Manganese is an essential nutrient involved in numerous chemical processes in the body, including the processing of cholesterol, carbohydrates and protein. The highest concentration of Manganese is in bone marrow and this contributes to the maintenance of normal health and structure in bones. As the mineral is needed for collagen production, it is also important for skin health. Manganese is a co-factor for an enzyme called manganese superoxide dismutase, which is a potent antioxidant associated with protection against free radical damage. Manganese deficiency is uncommon; there is greater concern for toxicity related to overexposure. Omega-3 fatty acids are considered essential fatty acids. Although necessary for human health, the body is incapable of producing them on its own. Omega-3s belong to a broader group of fats called polyunsaturated fats or PUFA. There are two major types of Omega-3 fatty acids in our diets: one type is alpha-linolenic acid (ALA), which is found in some vegetable oils, such as rapeseed, Canola, flaxseed, and in walnuts. The other type, eicosapentaenoic acid (EPA) and docosahexaenoic acid (DHA), is found in fatty fish. The body partially converts ALA to EPA and DHA. Western diets are typically low in Omega – 3s. Omega-6 fatty acids belong to a group of fatty acids called polyunsaturated fats or PUFA. The primary dietary Omega-6 is linoleic acid (LA), which, although not produced by the body, is considered an essential fatty acid as it is necessary for human health. Linoleic acid is part of cell components, and is used to manufacture signalling molecules in the body. LA is converted in the body to gamma-linolenic acid (GLA). It is then further broken down to arachidonic acid (AA). GLA is found in several plant based oils, including evening primrose oil, borage oil, and blackcurrant seed oil. Potassium is a mineral (electrolyte) in the body. Almost 98% of Potassium is found inside the cells. Minor changes in the level of Potassium that is present outside the cells can have severe effects on the heart, nerves and muscles. The kidney is the main organ that controls the balance of Potassium by removing excess potassium into the urine. Dehydration, diarrhoea, excessive sweating (hyperhidrosis) and laxative abuse are common causes of low Potassium levels. Deficiency may also be caused by a lack of Potassium in the diet; however, this is uncommon. Other causes include medicines that affect the amount of Potassium in the body, such as diuretics. Selenium is a trace element that is required in small amounts, but like all essential elements, can be toxic at high levels. Generally, Selenium acts as an antioxidant that works together with Vitamin E. It is part of the numerous enzymes that play a critical role in reproductionand DNA synthesis. Selenium concentration is higher in the thyroid gland than in any other organ in the body, and like Iodine, Selenium has an important function in thyroid hormone synthesis and metabolism. Significantly, Selenium contributes to the normal functioning of the immune system and it is required for the maintenance of healthy hair and nails. People who live in areas where there is very little Selenium in the soil (for example China), have a higher risk of deficiency, as do the chronically ill.
Fat-soluble Vitamin A is present in food in two main forms: retinoids (found in animal products) and Provitamin A carotenoids (found in plants). The most important Provitamin A carotenoid is beta-carotene, which the body can convert into Vitamin A. As an essential component of rhodopsin, a protein that absorbs light, Vitamin A is crucial for vision. It supports cell growth and development and also plays a vital role in the normal formation and maintenance of the heart, lungs, kidneys and other organs. Vitamin A is involved in immune function and is necessary for the health of the skin and mucous membrane. People in developing countries and patients with cystic fibrosis are at risk of Vitamin A deficiency. Vitamin B1, also known as Thiamine, is one of 8 B vitamins. All B vitamins help the body convert food (carbohydrates) into fuel (glucose), which is used to produce energy. As Vitamin B1 plays a central role in the metabolism of energy, deficiency in this nutrient impairs nearly every important function of the body. Thiamine is a water-soluble vitamin that plays a pivotal role in neural functions and is essential for the structure and integrity of brain cells. It is named B1 because it was the first B vitamin discovered. The most important use of Thiamine is to treat Beriberi, a fatal disease, caused by chronic Vitamin B1 deficiency. As cereals and breads are fortified with Vitamin B1, contraction of this disease is rare in the developed world. People with heart failure, gastrointestinal disease, diabetes and alcoholics have an increased risk of Vitamin B1 deficiency. Vitamin B12 (Cobalamin) is part of the B complex of vitamins. As with the other B vitamins, it is involved in energy metabolism. Vitamin B12 is also required for the proper function and development of the brain, nerves and blood cells. An important role of Vitamin B12 is the prevention of excessive homocysteine build-up in the blood; elevated homocysteine levels in blood are a risk factor for cardiovascular diseases. Vitamin B12 contributes to the normal function of the immune system and helps prevent megaloblastic anaemia, which affects energy levels and causes weakness. As hydrochloric acid in the stomach is necessary for Vitamin B12 absorption, the elderly are at risk of deficiency. Strict vegans and people with atrophic gastritis or celiac disease are at high risk of developing a Vitamin B12 deficiency. In common with the other B vitamins, Vitamin B2, also known as Riboflavin, is involved in energy metabolism. Riboflavin also serves as an antioxidant by fighting the damaging particles in the body known as free radicals. Vitamin B2 is required for the proper development and function of the skin, lining of the digestive tract and the production of red blood cells. It is also required to help the body process Vitamin B6 and Folate into useable forms. Interestingly, when there is a lot of Vitamin B2 in the diet (or in a supplement), your urine turns bright yellow. As a result of poor diet, alcoholics and even the elderly may be at risk of Riboflavin deficiency. Vitamin B3 or Niacin refers to a group of compounds that express Vitamin B3 activity. The basic type is nicotinamide. In common with other B complex vitamins, Niacin is important in energy production, participating in over 200 enzymatic processes in the body. Severe deficiency of Vitamin B3 can lead to a disease called pellagra, which manifests as serious dermatitis (rash), diarrhoea and dementia. Vitamin B5 or pantothenic acid is one of the B complex vitamins that helps the body to convert food into energy. Vitamin B5 is a part of one of the most important coenzymes in the body – coenzyme A. It takes part in almost 70 different chemical reactions in the body and thus significantly influences the level of energy. Pantothenic acid is crucial for synthesis of some hormones, vitamin D and some signal molecules in the brain. Vitamin B6 is a water-soluble vitamin naturally present in many foods. The body requires Vitamin B6 for more than 100 enzyme reactions involved in metabolism. It is also involved in brain development during pregnancy and infancy and supports immune function. Vitamin B6 is crucial for converting carbohydrates into energy and is necessary for the synthesis and decomposition of proteins. Vitamin B6 is involved in haemoglobin formation (haemoglobin is found in red blood cells and is critical to their ability to transport oxygen throughout the body) and in maintaining normal levels of homocysteine. It is worth noting that even moderately elevated levels of homocysteine in the blood have been associated with an increased risk of cardiovascular disease. Inadequate Vitamin B6 presence is usually associated with low concentrations of other B-complex vitamins, such as Vitamin B12 and Folate. Groups at risk of Vitamin B6 deficiency are individuals with impaired renal function, people with autoimmune disorders, celiac disease, Crohn's disease, ulcerative colitis and alcoholics. Women who take oral contraceptive pills have an increased risk of Vitamin B6 deficiency. Vitamin C may be the most familiar of all of the nutrients. It is a water-soluble vitamin that acts as an antioxidant, helping to protect cells from the damage caused by harmful free radicals. Vitamin C is required to produce collagen, a protein that plays a critical role in the structure of our bodies. Collagen is very important for healthy skin, gums, blood vessels, eyes, the central nervous system and reproductive organs. Vitamin C improves the absorption of iron from plant-based foods and helps the immune system work properly in protecting the body from disease. Vitamin C is also necessary in the formation of neurotransmitters such as serotonin, a hormone that plays a critical role in the nervous and endocrine system. Historically, Vitamin C was used for preventing and treating scurvy. Scurvy was once common among sailors, pirates and other seafarers. In the absence of fruit and vegetable supplies over long periods of time at sea, those aboard began to suffer from a Vitamin C deficiency, which led to scurvy. Vitamin D is frequently called the sunshine vitamin because it can be synthesized in the skin by exposure to direct sunlight. There are two main forms of vitamin D – D2 and D3. D3 or cholecalciferol is naturally occurring and used for low-dose supplementation. Vitamin D has the structure of a steroid hormone and behaves as such in the body. Apart from the generally acknowledged role in incorporating calcium into bones and teeth, Vitamin D has a number of vital roles in the body. It is important for normal muscle function and a normal immune system. Vitamin D deficiency is common and results from inadequate exposure to sunlight and inadequate dietary intake (usually occurring together) and from chronic kidney disease. Vitamin E is a powerful antioxidant. Fat soluble, it offers protection against damage to the fats that line the outside of every cell of our body. Vitamin E is a term describing eight different naturally occurring nutrients: four different tocopherols and four different tocotrienols. Of the Vitamin E group, alpha-tocopherol is the most widely known. Although Vitamin E deficiency is rare, marginal intake is relatively common. People with disorders that cause fat malabsorptionare prone to deficiency. Zinc is an essential trace element for all forms of life. It plays a crucial role in growth and development, immune response, neurological function and reproduction. With over 300 different enzymes depending on Zinc, even a mild dietary deficiency can have far-reaching health implications. Zinc plays a significant role in maintaining vision and is present in high concentrations in the eye. It also affects the structure of proteins and the cell membrane and is a powerful antioxidant. Zinc helps to heal wounds and is important for the proper maintenance of taste and smell. Groups at risk of Zinc deficiency are people with gastrointestinal diseases, vegetarians, pregnant and lactating women and alcoholics.